This page shows the most recent bird observations from the eBird database for selected counties for a specified number of previous days. It supports filtering the observations according to words found in bird and location names, hiding common bird species, and sorting the observations. This is where you control what observations are retrieved from the eBird database. You must check at least 1 county, and no more than 5. The available data is limited to observations within the last 30 days. Only the most recent observation for each species & county will be included. 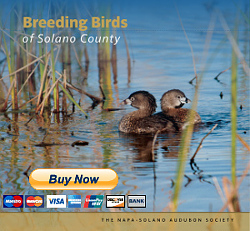 For example, if you check both Napa and Solano Counties, 2 observations may be shown for many of the common species, one from each county. If you just entered your own eBird observations but you cannot see them here, be patient; it sometimes takes a few hours. After data has been retrieved, these controls allow you to filter the observations. The default setting displays all data, but previous settings will be remembered and reapplied when you get new, different observations from eBird as long as you stay on this page. The 'Word filters' section selects observations to display according the the presence or absence of words in the bird and location names. Select whether to 'show only' or 'hide' birds or locations whose names contain 'any' or 'all' of the words of interest. Multiple words should be separated with spaces. Click 'Apply' or press the return key to apply the word filters. Note that partial words may be enough to match the desired observations. For example, "tricol" will show Tricolored Blackbird sightings. Checking 'hide very common birds' will hide observations for a preset list of birds which are very common or abundant throughout the area. Checking 'show county' will display the name of the county for an observation before the location name. Observations at eBird hotspots will have a red asterisk (*) after the location name. Observations which have been confirmed by an eBird reviewer will have a green checkmark ( ) next to the number of birds observed. Clicking on any bird name in the report will open a new "Bird Observations" page on the eBird site, showing a map with markers indicating recent observations for that species in the currently listed counties. It is fun to click on a marker to see the name of the eBird'er who made the observation. You will notice that the map usually shows more observations for a species; the default setting includes all observations for the current month plus one previous month (adjustable). The map and data may be retrieved slowly depending on connection speed, etc. Clicking on a column heading will sort the data by that column. Clicking again changes the order of the sort between ascending and descending. The sort column is indicated by an up or down arrow to the right of the column name. Note: For large sets of observations, filtering and column sorting may take a while, particularly in some older web browsers.